SMALL KUCING: Petai Fried Rice Recipe. This is another "basi" (Stale) post. Once in a Blue Moon, I would "offer" to help Mamarazzi to clean up the house compound. And once in a Blue Moon she would cook Petai Fried Rice. I don't like it much coz it's spicy. Hence she would omit adding Cili when she makes this but still I would preferred the normal fried rice. Seems now it's Petai Season again leh. Yesterday she went to market and they were selling big packet of peeled Petai for just RM5. Much cheaper than thos unpeeled ones from the roadside which sometimes cost RM1 "sepapan" . Errrr ...how to translate "sepapan" in English ah? Google Translator gives the meaning as "a loaf". It's more like a string/strand type leh . 1) 3 bowls of cooked rice(duh!). Best would be overnight rice. 3) some long beans from the garden. Chop it. Up to you how much you like to put in. 5) about 1cm of belacan. Best is toasted it over fire for the extra umph. 1) blend the dried shrimps and the belacan together. 3) Throw in the blended ingredients fry till brownish and aromatic (but me say stinky). Then add the overnight rice, long beans and petai. 4) When the rice is all coated with the blended dried shrimps and the Petai is half cooked, then serve. Yup...Mamarazzi likes the Petai to be half cook so that it will be more crunchy. Tada! okay okay.....sure this "pakai hentam" recipe won't win any prize but Papa would simply wallop it all coz got his favourite dried shrimp in it. For spiciness, Mamarazzi ate hers with Cili padi on the side lo. I, also like small kucing, would like normal fried rice. Hehe. Not a big fan of petai. That friend rice looks very tasty! 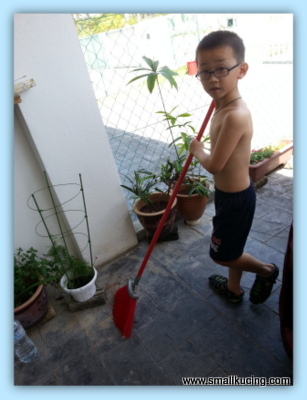 You are also a good helper for mama Kuching. Keep up the good work! Correct :) . Some won't like it coz of the smell. Nice fried rice with dried prawns and belachan.......however Petai is not our family, so don't think I will try this recipe otherwise nobody will eat it up! Yaya now like petai season like that. Last time rm5 only got 3 papan, now more than double. But I cannot make petai fried rice since won't use up enough petai Have to fry as a separate dish. yup...after blended it become hancur like meat floss. When fry it it become not much liao the dried shrimps. Very nice and heong having the rice coated with a lot of dried shrimp "floss"
hahahaha...you can make without the petai lo. Sounds nice if you like shrimps! Yummmm!!!!! Haven't had petai for a long time, lazy to go to the market. what la u...i nearly picked up my laptop and sniff the screen...so yummy! frozen petai it is this weekend! 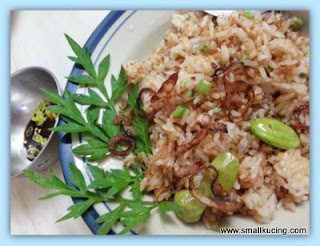 Petai fried rice I know very heong one.. Fragrant with harmai smell.. But I not a fan of petai..hehe.. Ya...some doesnt like Petai. Stinky leh. you same like me. Gimme5 ! hehehe, okaylah, fried rice only mah.. even Uncle SK also can cook that, so sure Mamarazzi has no problem lah, sure that was one plate of very delicious petai fried rice.. one thing Uncle SK likes about this fried rice is, there are lots of dried shrimps and also got long beans and red onions!! those are nice!! ooopsss, no eggs hor?? because Mamarazzi doesn't like eggs in fried rice just like her choice for CKT?? We like fried rice occasionally. Oh, I bet this is delicious! Hubby and I love petai! The price is same over here, RM5 for a packet. 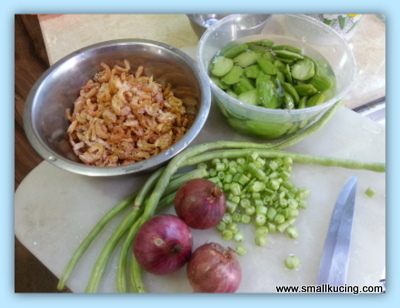 Usually fry petai with sambal belacan, sometimes with minced meat or lots of dried shrimps. Hubby wants lots, lots of dried shrimp. I must say that I love how you garnished the dish.. so cute.. The dish looks really good to me and must taste good too! I haven't been eating a lot of rice since I am watching the carbs... but I want to try this recipe. We love fried rice here.. but since I am watching my carbs, I hardly ever make it. I'm very jakun here, Blue Moon stand for? ?